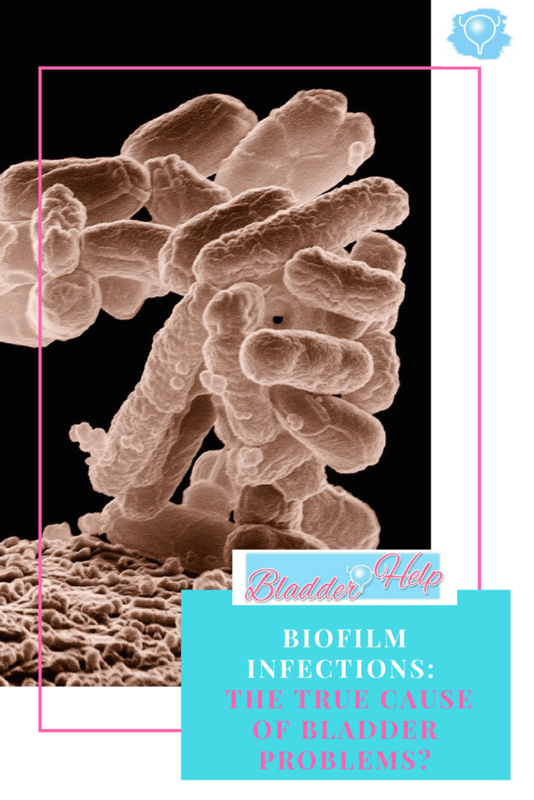 Biofilm Infections: The True Cause of Bladder Problems? If you suffer from recurrent urinary tract infections (UTIs) or interstitial cystitis you need to know about biofilm infections. More and more studies have demonstrated that pathogenic bacteria can persist within the bladder tissue and serve as a ‘reservoir’ for recurrent urinary tract infections. Bacteria and fungi can make so-called biofilms and hide under them. This protects the bacteria from being discovered by our immune system or from being killed by antibiotics. It also makes it harder to discover them in a urine culture. Biofilms are estimated to be the cause of up to 80% of all microbial infections . There’s a strong connection between biofilm infections, urinary tract infections and interstitial cystitis. How can bacteria persist within the bladder tissue? First of all, bacteria can develop new characteristics when allowed to proliferate inside the bladder. Through a process called ‘quorum-sensing’ (aka bacterial communication) the bacteria can sense a high density of fellow bacteria and then start to attach to the bladder lining. When enough bacterial density occurs, bacteria start to pass underneath the protective layer that is surrounding bladder cells (called uroplakin) and invade these cells. They then multiply within the cell and form a colony of rod-shaped microbes. As the colony grows, a pod forms and bulges into the bladder. This pod is covered by protective uroplakin. Once in the pod, bacteria change shape and start to produce a mesh-like fibre structure out of a kind of starch (polysaccharide). This structure is called a ‘biofilm’. The biofilm links the bacteria to each other and to the outside matrix of uroplaktin. The bacteria can now rest in the biofilm structure like ‘eggs in an eggshell’ . This structure can protect the bacterial community from changes in the environment, antimicrobial agents and the host’s immune defences. Living in a bacterial community has even more advantages: the bacteria can now share metabolic by-products (food) and transfer genes between them. This makes the bacteria more resilient. Moreover, the bacteria get the chance to reproduce and proliferate – without being disturbed. E. Coli and Klebsiella are believed to be the main urinary tract infection causing bacteria. Unfortunately, they are also both avid biofilm formers . A recent study showed that 74% of E.Coli bacteria responsible for relapses of UTIs were biofilm formers . Once the bacteria have reproduced, they can detach from their biofilm matrix and cause another bladder infection in another part of the urinary tract. Through the quorum-sensing process they may also be able to become an antibiotic-resistant bacterial community. Antibiotics may or may not be able to get rid of the recurring bladder infection but as the rest of the bacteria are protected in the shelter of their biofilm, infections may recur again and again. Therefore, chronic UTIs could really be a biofilm infection. The symptoms of interstitial cystitis and chronic UTIs are often hard to distinguish. The main difference is that interstitial cystitis is present all the time whereas UTIs come and go. UTIs are usually diagnosed when bacteria are detected in the urine. In interstitial cystitis, urine samples usually come back clear. When we look at biofilms, we know that the bacteria are present. But because they are sheltered, they are not easily detectable or destroyed. Sounds familiar? To me, this very much describes interstitial cystitis. Therefore, if you suffer from interstitial cystitis you may indeed be suffering from biofilm infections. It is unlikely that this would always be the cause as interstitial cystitis is such a multi-factorial condition. But it may be one piece of the puzzle. Stay tuned as I will discuss testing and treatment options for biofilm infections in Part 2! Now I’d like to hear from you. Do you think your bladder problems could be caused by a biofilm infection? Have you found relief with biofilm treatment? Let me know in the comments! I think I have problems caused by biofilm. Just had a cycoscopy and was told I have Cystitis Cistica, There is a cresent shaped area of tiny blister like cysts. How can I cure this? I feel I have biofilm after reading this article. I have had UTI for 4 yrs straight that have not been interrupted by antibiotics. Yes, after years of fighting E Coli UTI’s and now being resistant to oral antibiotics I had to do 10 days of IV antibiotics in the hospital and at home only to have the infection return immediately after! I’ve seen a Urologist on a regular basis and had several tests and procedures. He never mentioned “Biofilms “ and I’m wondering if they showed up on the Cystoscopies without mention?? I recently increased my D Mannose Supplement dose and ordered Interface Plus as well as pounding water, Kefir, garlic, and Fenugreek!! What have others tried with success?? Why would you post all of this and not any info on treatment? I have a true biofilm of klebsiella. It was aquired after a Foley catheter was inserted for a surgery. Every month I have a positive culture, treat with antibiotics, and it goes away for a few weeks, comes right back. Same strain. Grows resistant to antibiotics I use longer term. I have also met someone else with my exact same strain who has surgery at the same hospital. (Women’s hospital of Texas). We both now see an infectious disease. I have been dealing with this a year. My friend, 4 years. She has had over 40 bladder irrigation’s and even had the lining of her bladder stripped away with my irrigation’s (filling it up with antibiotics directly). No luck. Turns out there is no solid treatment out there. Nothing. I’m still searching.